The Mason-Dixon Knitting sisters got this Knit along going using the Stopover Pattern by Jane Mucklestone. Fortunately for River Colors, some wonderful customer named Jen included us as a source link for Lopi yarn in one of the discussion threads about the knit along. We have been shipping Lopi galore. How fun is that? Many local people got into the kal as well so we have been vicariously living color combinations. Don't be afraid to change your mind if you get into it and find that the color combo is not right. One of the beautiful things about this project is that the yarn is not expensive. You can see from my posting yesterday that I did just that. While I love the gold, green and navy combo, I decided it was just a tad too handsome for the look I wanted. I took my pop color(the pink) and changed it out for the gold. Now I love it! 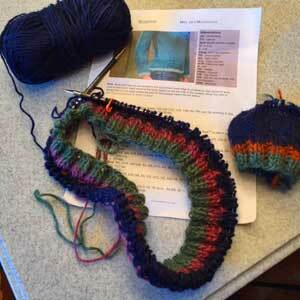 Starting with the sleeve is a good way to check your gauge and your color choices. That is how I discovered that I was not getting the colors I envisioned and that my gauge was way too tight. I am using the 9 inch needles instead of double points, it just simplifies the color change process. Off the top of my head I can not remember if you can get 9 inchers in 10.5 needles. I will have to research that. I started off with smaller needles(size 7 and 9)than recommended because I am usually so loose. Now that I started the body and my gauge is working I am actually on a size 10. You can still join in the fun,there are lots of color choices left and am expecting some of the light greys this Monday. Here is my progress since yesterday morning....I got to the first decrease and had to stop. See you all later, the store is going to be hopping with classes today so I need to go. I am so sorry! I need to catch up...changing my needles, changing my colors. Please stop back on Saturday for a discussion. 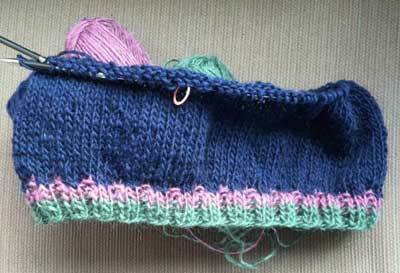 Today, I post a picture of the evolution of my Stopover and why I have to knit like crazy today!